If you’re the outdoorsy type, chances are you’re chomping at the bit to get up and go this spring. If you’re an RV owner, this may not mean tackling the trails and packing up the tent; instead, it may mean prepping the hookups and hitching up to explore the natural environments of BC from the comfort of your trailer. Before you can hit the road, there’s a lengthy - but welcome - process to gearing up your RV for another season. Here are some useful tips for getting the RV ready for hitting the open road this Spring & Summer! Water leaks can be common and are sometimes one of the biggest problems you’ll encounter after a long winter of storage. Check the roof and all of the seals and caulking around the vents, air conditioning units, skylights, windows and doors. You’ll need to make sure there is nowhere for water to seep through. If you do encounter some damage, take your RV to a professional to seal everything up, or invest in water-sealant caulking to fix the cracks yourself. Be sure to do this at least 48 hours before taking your RV to any destination where rain or moisture may be of concern to give the product time to cure and firm up. Any RV is wholly dependent on its tires for transportation. Inspecting tires on a regular basis is part of the basic maintenance process of any motorized vehicle. Cracks or bulges in the tires are a serious sign of wear and tear and should ideally be replaced. Part of checking the tires includes checking the air pressure. Consult the owner's manual of your RV or the printed decal on the inside of the driver’s door for applicable air pressure recommendations cited by the manufacturer. Before you fill up the water reservoir and test the lines, always ensure that the hot water bypass valve is in the normal position and all of the faucets in the RV are closed. Turn on the cold water while filling the tank to allow air to escape until the flow is steady and consistent. Take this time to inspect that all the faucets and pipes aren’t leaking - as RV’s sit in the cold over winter, things can dry out and crack. All sewer hoses have limited lifespans, and a leak in a hose can mean a rather unpleasant disaster. Thoroughly inspect your hoses prior to use and replace at the first sign of trouble. The valve seal on the waste tank is also important. Slowly work the valve to ensure that it is opening and closing properly - and do this on an empty tank as soon as you take the RV out of storage. Performing this maintenance check with a waste tank that’s been recently used is a no-no. It’s also a good idea to do this type of check at an RV waste dump station. Valves can stick and become difficult to operate over time, so if opening and closing the valve is tough, it may be time to replace the mechanism. Alternatively, valve lube is commonly available at all auto part stores and RV mechanic shops. Ensuring that your gasoline generator is in tip top shape is a great way to give yourself peace of mind while on a trip. Before you hit the road, make sure that the engine has clean oil, at least a full tank of gas, and an easily accessed spare jerry can. Always make sure the generator starts easily before relying on its use. When you’ve let the motor run for about 10 min, check the oil while its warm to get an accurate read on the fluid level. The awning is a staple of enjoying the afternoon sun and getting outside during a downpour. Roll out your awning while you investigate the state of your recently liberated RV to make sure there are no tears or weak points, and any spots where the awning material has detached from the roller arm. If the awning is difficult to extend, there may be an issue with the spring tension, and this should always be repaired by a seasoned professional as the mechanism is under pressure. Most owners will complete a thorough clean prior to storing their RV for the winter, so think of a spring clean as more of an opportunity to freshen up the space, get some fresh air inside, and tidy up any of the winter storage accoutrement that you may have left out. Many people opt to store their RV’s in cold storage spaces like barns, warehouses, and designated storage garages. With the possibility of mice or other tiny creatures making their way into your RV through the chassis and undercarriage of the vehicle, many owners will typically head off their unwanted advances by placing mothballs or dryer sheets at any possible entrance points - vents, floor cabinets, etc. In the spring, be sure to take a good look around and scoop these up. If you typically find that mice are a problem, regardless of your deterrents, you may also want to disinfect and clean all surfaces in the spring with antibacterial solution. Reconnecting the batteries that power all DC electronics in the RV is a quick spring-time task. This will give you back your lights, and will fire up your refrigerator/freezer should it run on electricity - some will run on liquid propane, too. Many owners will remove and store their batteries in a warm, dry space for the winter season, but others may leave their batteries onboard in a disconnected state. This is okay, but come spring, battery terminals, connections, and battery trays should be inspected for signs of corrosion and leaking battery fluid. 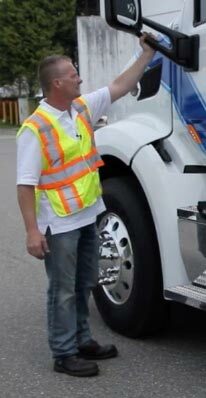 This is also a great time to have your battery inspected at your local RV dealer or repair centre. If you find that you have to replace your battery, make sure that you don’t add a new battery to a bank of used batteries. Aside from cleaning your appliances with household cleaners, take the time to do a detailed inspection of the outside access covers and ports - specifically for the fridge and water heater - for things like nests, organic material and debris. Refrigerator appliances should be stored with the door open to help prevent mold and mildew. If the fridge was stored closed or somehow shut itself during the storage period, an intensive cleaning of the interior will have to happen. If your appliances are operated with liquid propane, this is also an excellent time to make sure all knobs and dials are turned to the “OFF” position. Before you begin to reconnect all liquid propane (LP) hoses and valves, take the time to double check that all appliances are shut off. Ensure there are no open flames, sparks, excessive heat, or smoking near the appliance and make sure the leak detector is turned on before moving forward with your LP connection. Open the valves on the propane tank and try to smell out any potential leaks. Next, check the regulator and valves using soap suds as a visual aid or leaks. 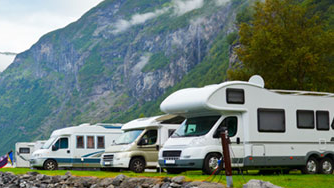 Proper RV storage will help to eliminate the hoses and connections from drying out, but over time, winter storage can dry the seals out. If you suspect a gas leak in your lines, have a professional inspect the integrity before using them. Getting the RV back on the road is one of the most exciting times of Spring. Spring and Summer camping while experiencing the majesty of the British Columbia landscape is a great way to spend time in your home-away-from-home. 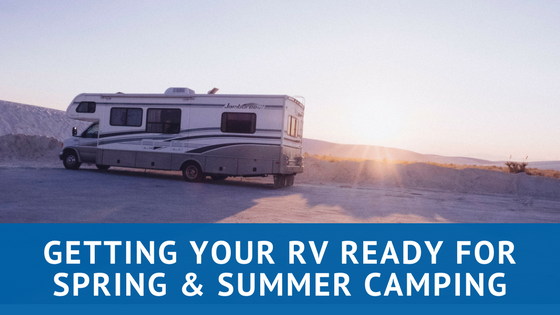 Properly preparing your RV is a surefire way to enjoy every second of this short season while it lasts!